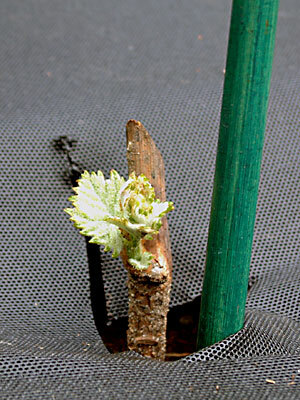 The following pictures show the cuttings that we received just after we had planted them and as they grew for the first few weeks and months in our vineyard. 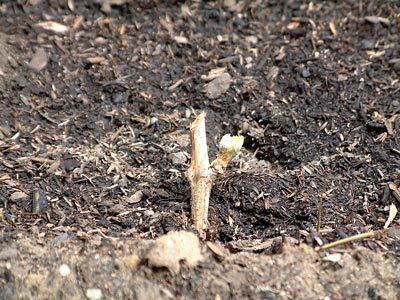 The first picture shows the cutting just after we planted it. The picture shows the scale of the cutting to the area of planting. The second picture gets closer to the cutting. At this stage, in early May, all that shows on the cutting is a single bud. One week after planting, the bud has started to open up. 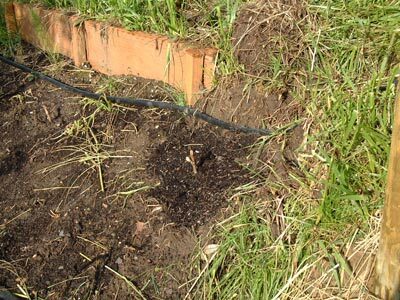 Nothing else has appeared to happen although we hope that the roots have started to become better established. 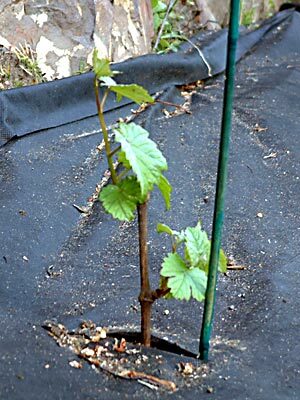 Three weeks after planting, some of the cuttings have started to grow more vigorously. At this point, the plant has grown to be about three or four inches high. 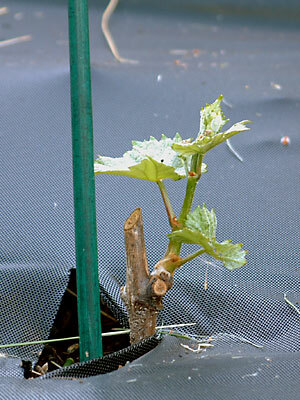 There is a significant difference between the growth of the cutting (above) and the growth of the one-year old vines. Both started at about the same height but the one-year old is growing much more vigorously. The Wine Enthusiast is a great source of glassware, serving and preservation systems, in addition to self-contained wine cellars and other wine storage options. If you're not sure what you need, the company offers a list of 'Recommended' items that cover a wide range of needs through their home page. Wine glasses, decanters and more: Many choices are available including Riedel and Spiegelau crystal stemware and decanters. Plus, there are many products to clean and care for your glassware. Serving and preserve your wine, from the most elegant decanters to chillers, coasters, drip savers and more. When we want wine by the glass (when we don't think we'll finish a bottle), we use the WineKeeper which automatically fills the bottle with nitrogen to preserve the wine. Corkscrews and cork pullers are essential tools. Wine Enthusiast has a wide variety of devices including the traditional Laguiole corkscrew to the smooth Rabbit Corkscrew leverpull types. Storing your wine doesn't have to be difficult. Wine Enthusiast offers everything from free standing wine cellars to wine racks and cooling systems that can be installed in a closet or a corner of the basement. Finally, for great deals, don't forget to check out the clearance items and the Wine Cellar Outlet Store areas.